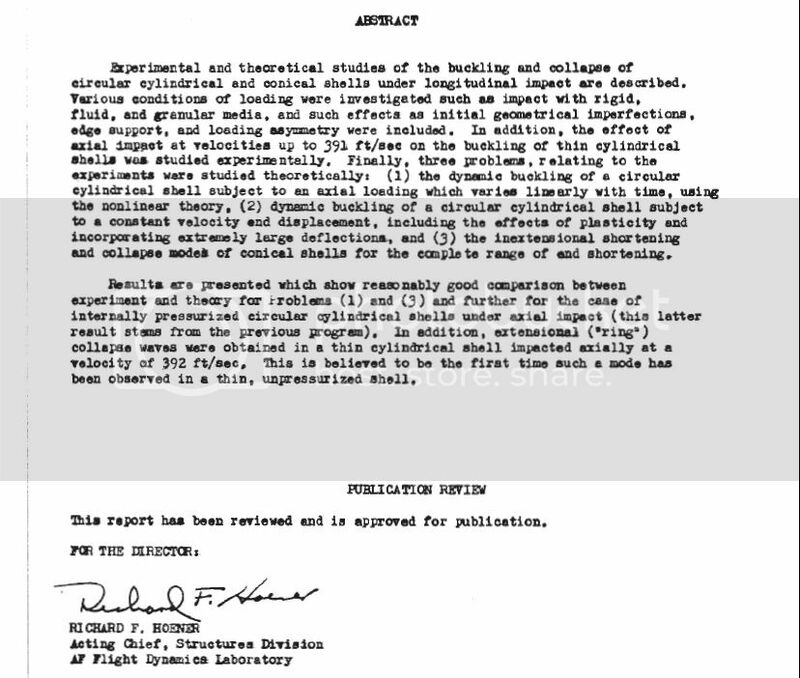 Pilots For 9/11 Truth Forum > Scientific Study - Dmole Please See This. Full Version: Scientific Study - Dmole Please See This. With reference to the totally unbelievable scenario of a huge Jetliner ploughing it`s way and completely dissapearing into "soft dirt"
Decide on the outcome and then fudge all the data to suit. dMole I hope you dont mind me putting your nick in the topic tiltle, I felt this analysis might be right down your street. Wright-Patterson Air Force Base, Ohio. BTW. Since time began every impact of a body traveling at speed and hitting the earth has always produced a crater effect. Search google images for `crater` Only a knife blade can penetrate sand without creating a massive circular crater. Actually, "guilty as charged-" this is very close to the kind of work/projects that I (and some friends and family) have done for US govt. agencies at times. 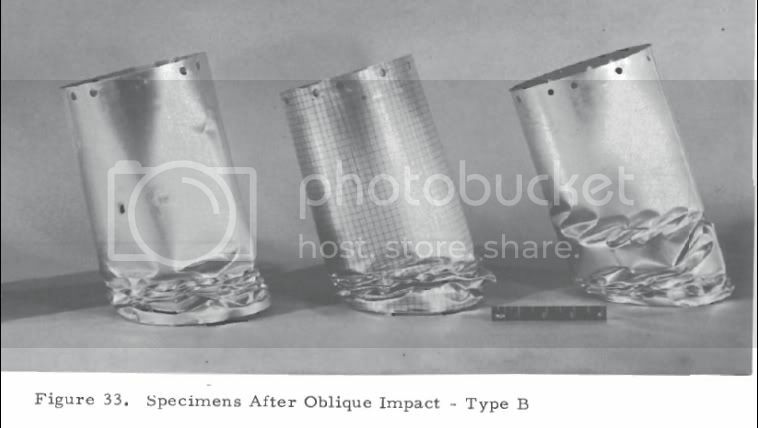 I just skimmed the report, but I would have run the experiments with different thicknesses of cylinder (and different materials) with high-speed video taken. 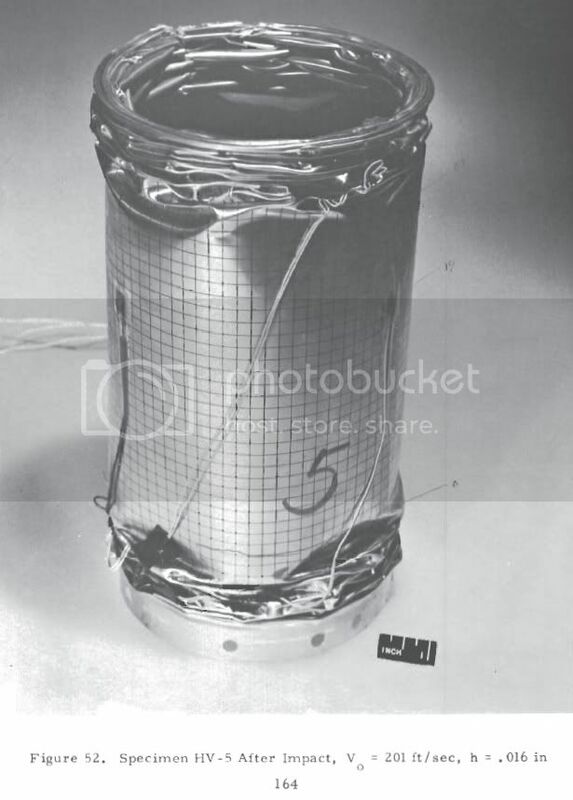 I also would have tried cylinders filled to various pressures with different compressed gases. I was fairly close to doing this exact type of work for the US Army several years ago (likely for the M1 Abrams MBT), and I'm not exactly unfamiliar with what goes on down in the New Mexico (and other) deserts. Exactly- one of my relatives did a Ph.D. dissertation on impact craters for a fairly well-known university back in the pre-Apollo days. Meteor Crater in AZ is the example that immediately comes to my mind. High-velocity impacts actually get a little curious though, and terminal ballistics is a fairly complicated thing. The DoD seems to have settled with toxic though highly-effective "depleted" Uranium 238 lately, and the Middle East (and Bosnia) will suffer the consequences for millenia. I also saw a technical film where a "high-powered rifle" [whatever the hell that media "buzz word" means] round was compared to a compound bow's arrow fired into plastic 5 gallon buckets of wet sand. Most people were quite surprised at the outcome. Thanks for your reply, seems you have led an interesting and varied working life. I`m guessing the arrow penetrated a lot further/through ? This is a high speed camera perspective of a drop of water impacting into sand. Yeah, I had the Navy recruiters dogging me hard for several years, and several friends and family ended up on nuclear subs. I've heard some interesting tales about the old Cold War days. On the arrow, it went slicing through the bucket, shattered a glass jug on the back side of the bucket, and kept flying downrange. I can't remember if it was a 3 or 4-blade hunting broadhead (vicious little things those and razor sharp), but I suspect that a simple "target" point would have done the same thing. The rifle round was a surplus? 150-grain 30-06 Springfield that actually had little effect on the bucket of sand. Sandbags are used by the military for good reason. A 30-06 rifle isn't all that extreme, although it will dispatch a 700-lb elk rather quickly, and may have something to do with the fact that the British Isles aren't speaking German right now. I loved your water drop video. I could watch those slow "high-speed" videos for hours (I've heard that I'm weird though)- I blame weird science. 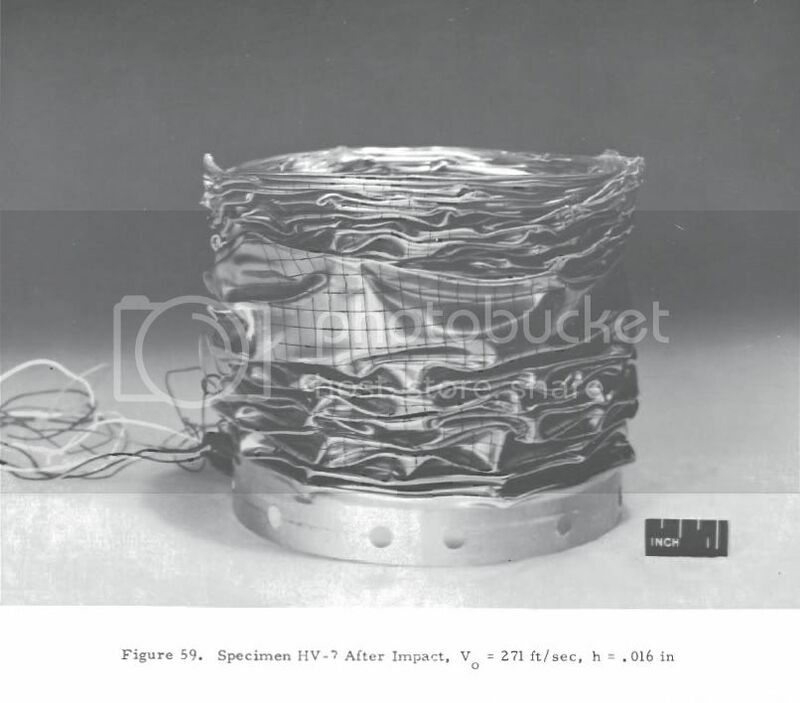 I had a collection of high-speed photograph sequences of hand grenades and other explosives somewhere, but engineers have stolen some from me over the years. Off-topic, but here are a couple that I found linked from your video Teardrop. and like watching the Towers collapse, the eye cannot fully interpret what it is seeing. Or is what is happening in that video the answer ? Ultrasonic soundwaves producing those billowing streams of dust. Hmm.. has anyone ever done a study on soundwaves physically altering a material substance. Steel to dust anyone ? Either of you familiar with the work of Hans Jenny? 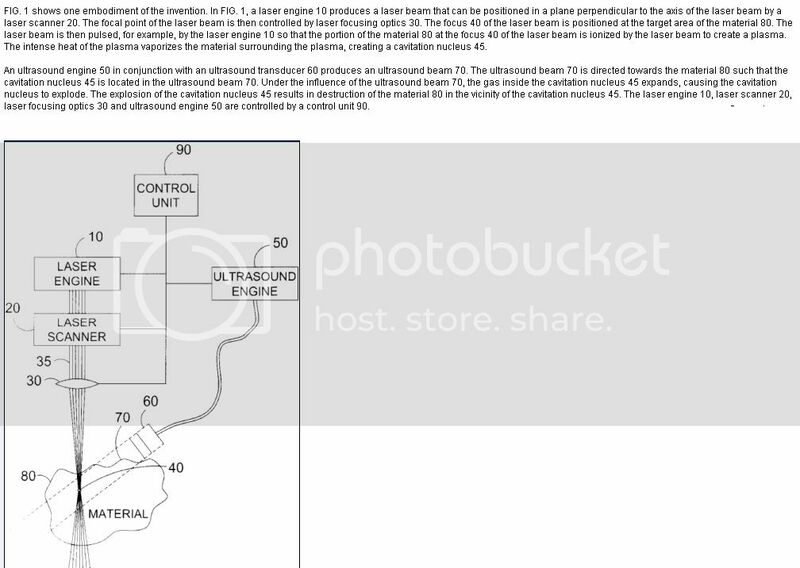 the following image was put together from the wikipatent article. I wonder why they needed thermite? I must have another look at thermite, the only clip I have watched shows railroad track being cut. Seemed quite a slow process, which means how did they time it on the Towers to do such a precision balanced drop. Twice. Yeah and add explosives to that as well, blowing huge metal panels sideways through the air. It seems they used the whole toolbox on that op. visible chunks can be drawn out of the dust with a magnet! There was a tremendous amount of destructive energy put into the demolition of the whole WTC complex, and building 7, (not even in the same block), that day.